I was commissioned by APM, a high end shopping mall in Hong Kong, to create sculptural LEGO seating and decor for the mall's new lounge. The lounge was to feature a botanical theme, so I created several benches and stools, a floral mural, an orchid sculpture, and some lighting, all with a floral and botanical theme. 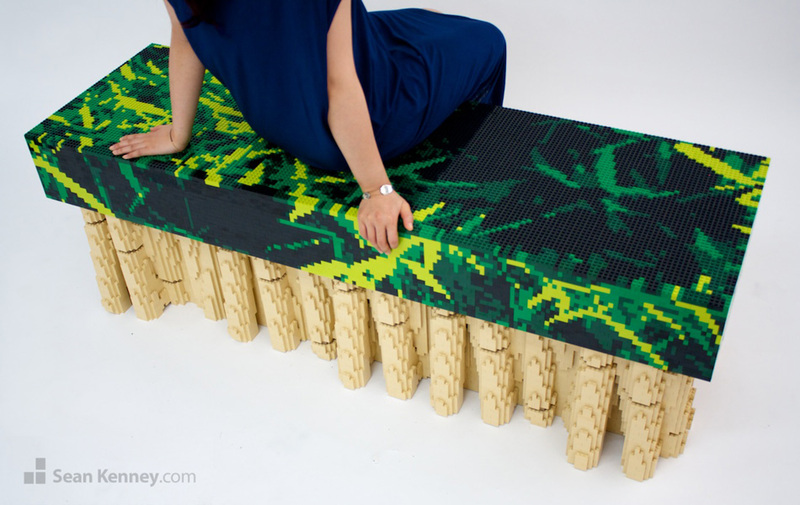 My thought with the design was to first imagine that it wasn't made with LEGO pieces at all, and instead was fabricated with plastic or wood or metal; how, then, would a manufacturer achieve the look of a bamboo forest that would still function structurally as a bench? Thus the idea for this piece was born. Additionally, the sculpture is reinforced with a sturdy steel frame to support the weight of a few grown adults, and is entirely glued for stability. This bench is now permanently installed at APM mall, so if you're ever in town go take a look (and a sit) !